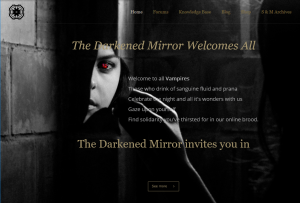 Welcome to The Darkened Mirror! We still have some tools, sawdust and some discarded packaging laying around the site, but these things will get tidied up as we go. Since I’ve never owned any forum or site where there was not something constantly being fixed or changed, I imagine most of my staff and members are rather accustomed to that. Such as it is I present you with my new home. The Darkened Mirror will be hosting a long term project by way of our Knowledge Base which some of our teachers and volunteers will be working on with the long term goal of creating a community encyclopedia housing our community history and a who’s who of houses and short biographies of those who have been influential and instrumental in building the community we know today. If you have an interest in helping out with the project, please contact Lady CG. The other change of note is my Lady CGs Blog will now be hosted on The Darkened Mirror. I will still share the posts to my Lady CG page on Facebook, at least for now, so if you follow me there you will likely not see much change. For those who have asked about Smoke and Mirrors, it will remain on tapatalk where it is for the foreseeable future, but the link has been provided at the top of Darkened Mirrors main menu for convenience. Many many thanks to my much beloved tech Bearcat for all the hard work and grey hair my project has caused him. Without his dedication none of this would have happened. He’s been patient, kind and professional, all of which I will appreciate for the rest of my days. I’d also like to thank my teachers for stepping up and taking on forums, writing up lesson plans and offering me every kind of encouragement. You guys ROCK! Seriously? I was hoping for the best when I put the call out for teachers willing to teach forums in a Collegiate format, which I don’t think I’ve ever seen done in the community before, and what I got were top notch professionals, many of whom have served our communities for years, some for decades. I am both grateful and humbled by the sincere dedication of these, our communities teachers. With all that out of the way, I welcome you, the reader and invite you to take part in our new community project.